Us Trails Rangers, we are a very interesting breed. Often we have this ‘rugged ranger’ image. Someone that is in charge and in control, maybe a bit rough around the edges. And I can understand that the Trail guests look at us as their lifeline, we carry the rifle after all. (Not that we intend to use it.) Besides, it would not assure any confidence in them if we were nervous and unsure of our selves. Often I’m told that in a potentially dangerous situation the guests felt nervous, but seeing me act calmly and without panic, reassured them. That’s a relief because in a close call it sometimes feels like my heart is redlining ha ha. On one of my Olifants wilderness trails, we had to use a standby vehicle: the sluggish 2,5 diesel Toyota Hilux. We normally use a land cruiser on the Olifants trail, as the roads and terrain need a very capable vehicle to get to the trail camp. This trail, however, the Landcruiser was in for a service so we had no choice but to use the Hilux. Being a bit underpowered and loaded with 10 people (8 Trail guests, me and my assistant) and then towing a trailer with the luggage food and drinks for the guests, the Hilux complained on every uphill. And often I had to put it in Low 4 (4X4) just to ensure I didn’t stall on the uphill. This was already a bit embarrassing for me as the cruiser never complained. I just hoped the guests did not doubt my driving skills… that would be a bad start for the trail! So early on the first morning before sunrise, we were on our way to the walking site. 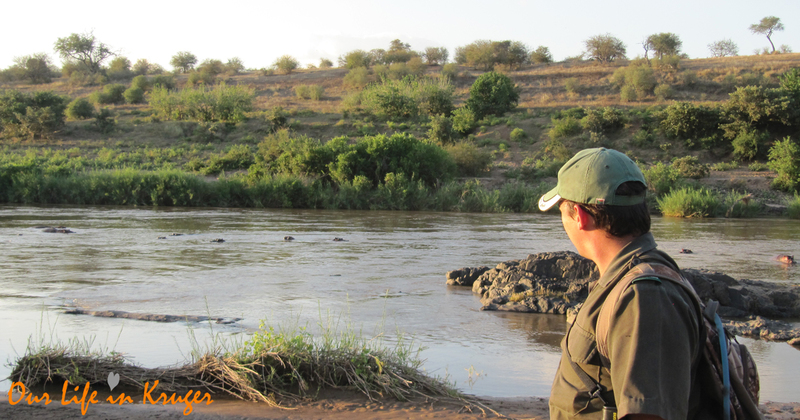 I wanted to walk on the Nhlahlene stream, as there had been some nice animal activity around the available water. After a very pleasant walk, we returned to the vehicle hot and thirsty only to find that I had left the headlights on… And the battery was completely drained… Eish! No problem, we can push start it, so I thought. But after numerous attempts, I realized this vehicle does not do a push start and I would have to make a plan for assistance. I considered a few options. Generally, we have good communications but for some reason, the satellite phone did not want to pick up any satellites that day. The embarrassment was piling up. So I decided to walk and try to get some help. Not far from us was an army camp and hopefully, they could bring a vehicle with jumper cables. I asked my assistant to stay close to the guests and I decided to walk via the two-track roads to the army camp. Walking on your own in these areas does bring certain thoughts into your mind. Not so much about animals in my case, but more about the field ranger anti-poaching teams. See, on a trail, we are a group of maximum 10 people. The field rangers know what we are about and stay clear of us. But just me by myself and with a rifle? That could look totally suspicious. As these thoughts were milling around my head I suddenly heard a growl in front of me. Before I realized it a huge lioness jumped up out of the grass and ran to my right. I followed her movement and another lioness caught my eye to the left. I stood perfectly still and kept looking at both the lions. They moved off looking back at me with those soul-piercing yellow eyes lions have. I realized that these were most likely the two lionesses that we had seen with cubs a few weeks before. The beautiful tawny lions looked around a bit and then moved away and I have to admit I was very relieved the cubs were nowhere near; that would be a very difficult negotiation with two angry mommies. Fortunately, the lionesses were more interested in getting away from me than anything else and I did not mind one bit. I needed to get my guests back to camp! So I started walking again (looking over my shoulder every now and then) and as I got closer to the stream, I started looking for the army’s temporary camp. Last thing I knew it was somewhere around here, but today when I desperately needed some jumper cables, it was nowhere to be found! They must have relocated the camp! Ok, this was turning into a bit of a disaster. I noticed the tracks crossing the stream to the other side and figured they must have walked in further. So I took up the tracks and followed. Realizing I was getting closer to them I decided to turn my bush hat inside out. This shows a bright orange inner liner we call a day glow. It makes you visible and indicates you are friendly, and not a poacher – Or an illegal immigrant! When I got to a lone standing baobab tree I decided to check the sat phone again. Maybe I would pick up satellites to make a call. It took a few minutes but the connection was good so I decided to call the field ranger sergeant for assistance. As I was on the call I heard a francolin startle and fly off. Francolins are small brown chicken kind of birds and when something disturbs them they take flight making a racket. I knew something was up and I cautiously looked around the baobab and here I saw five army guys stalking me in flanking positions! I had to laugh because if it weren’t for the francolin they would have succeeded in creeping much closer before I realized they were there. But now I could enjoy watching them approach. When they got to a point close enough I very cheerfully stood up and waved at them shouting “Hellooooo” still using the tree as cover. The five guys looked up almost amazed that I spotted them. And then all smiled and fell into single file walking up to me laughing. They recognized I was in uniform and kind of wanted to see how close they could get to me. But luckily the little francolin was on my side and the joke was on them! So there you have it… Not my proudest moment as a Trails Ranger, but at least I got to see two stunning lionesses and watch the Army practice their flanking movement. I still have a quiet chuckle at that memory every now and then. Until we meet around the fire again! Great story Steven. One of the wonderful attributes of a Trails Ranger seems to be that they can always make a plan when normal changes to ‘wha-a-a-at??? ?’ Your life is certainly never boring! I had to smile at the way the stalkers were revealed by the alarmed Francolin. Look forward to the next campfire story! So true. My car was rescued in that way at the Skukuza workshop many years ago by a most wonderful practitioner of that philosophy! He saved our trip with a light switch and a couple of metres of wire! Great !!! It was like I have been in the Bush too when I was reading the Story. Interesting and not boring for a second. Really enjoyed your story.. shows that we can all make mistakes like leaving car lights on.. but you certainly had a good plan to sort it.. interesting that the lions ran.. thankfully they didn’t try to ambush you! My husband and I are coming to Krueger tomorrow.. camping at Lower Sabie, the camp where we first met in 1986 when he was working there and I was a British Airways hostie on holiday.. similar story to yours! Hi Barbara! Yay, so you will be back in the park soon! Enjoy your time in LS! An entertaining and well written story! I’m fascinated by every story. I have visited n stayed over in Kruger a few times n have enjoyd it. The atmosphere is awesome.